The Misuzawa High Karuta team return to defend their title at the Tokyo Regional championship. 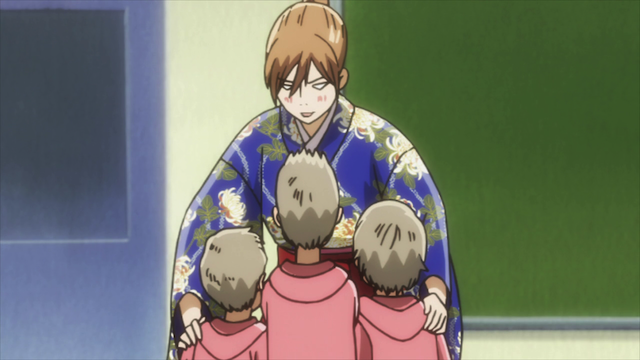 Chihayafuru season 2 episode 3 covers the start of the Tokyo Regional high school championship. We also get to see glimpses of Arata Wataya and Shinobu Wakamiya, indicating that a real showdown is not far off. 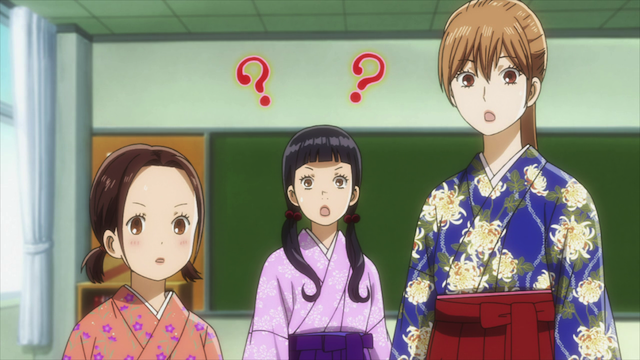 (L-R) Kanade Ooe, Sumire Hanano, and Chihaya Ayase are surprised by a last minute change to the team’s composition. Again, much of the episode’s drama revolved around the first years. The returning characters however, each had moments to demonstrate their growth by acting as sempai: Kana dressing Sumire up in a hakama, Tsutomu making the last minute changes to the schedule to give the first years a chance to play, and the flashback of Yuusei teaching Akihiro. Chihaya looks like some evil ghost taking the children away. Although both of the first years lost their matches, they seemed to learn valuable lessons. I will enjoy seeing the rehabilitation, and hopefully a sweet moment of success for Sumire and Akihiro, but there was a much more exciting development in this episode. Both Arata and Shinobu are confirmed to be participating in the high school tournament. Further, there seems to be some history between Arata and Shinobu. I have been looking forward to seeing the inevitable rematch between Shinobu and Chihaya, and Arata was the shadow that was cast over the entire first season, so it will be very interesting to see how they use him now that he has returned to the world of Karuta. Good matches hopefully to come then, pretty much calm and comical so far which is a nice relaxing start to the new season. At least we can tell that the two newcomers will surely improve from now on. 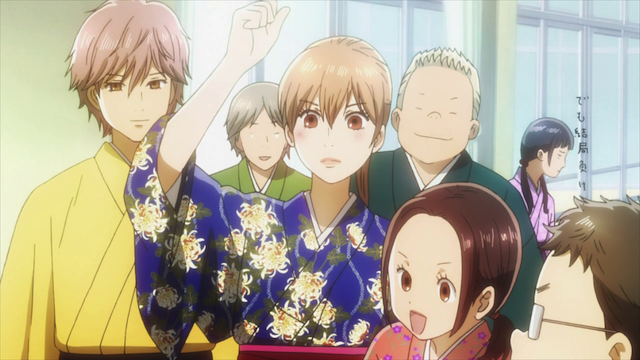 Hasn’t lost any of the characteristics that makes it chihayafuru, I was worried that this season may get a bit too serious with Chihaya still aiming to become queen, but glad the comedy’s still as fun as ever. Yeah, they managed to ease into it, and yet we are already enmeshed in a regional tournament. I like. Yeah me too, dived into it, yet still eased into it. I’m pretty sure you’re not the only one looking forward to seeing the inevitable rematch between Shinobu and Chihaya. It’s been almost a year now. I can’t wait!